It started small and through grassroots efforts — as many events do — and evolved in the years that followed. With a rich history now behind it, a new chapter for the former La Jolla Festival of the Arts is about to emerge. As the venerable all-volunteer festival prepares to commemorate a 30-year milestone, the chair of the event, Peter Ballantyne, cannot help but wax nostalgic, yet look gleefully to the future. Beyond the three-decade benchmark, there are several other notable aspects of this year’s program. For the first time in its existence, the festival is leaving La Jolla, and the move prompted a new name, San Diego Festival of the Arts, to reflect the pivotal change. The art show, which is being held June 11-12 this year, has been a mainstay in San Diego’s arts and culture scene, and Ballantyne said he has high hopes with the transition to the County of San Diego’s 2-year-old Waterfront Park, which will provide the wealth of green space needed to put on the two-day event. While there is a groundswell of enthusiasm for all the changes, Ballantyne and Mullen were quick to point out they were not actively seeking a new venue for the festival until a series of large-scale circumstances were set in motion. A year and a half ago, Ballantyne said he and other organizers learned they were going to have to leave their longtime perch at the UC San Diego campus. The reason: The space they had been using was scheduled for disruption, as expansion work on the Metropolitan Transit System’s trolley line got underway. After ensuring no stone went unturned in their search, Ballantyne said organizers were supportive of relocating to the Waterfront Park. Several dignitaries, including Councilmember Todd Gloria, are expected to kick off this year’s festival to help usher in its new era. Gloria will read a proclamation to commemorate its move and milestone anniversary. Members of the U.S. Navy Band Southwest will also help kick off this year’s revamped festival. A ceremonial concert, including a rendition of the national anthem, will begin at 11 a.m. on the first day of the event. High-profile changes aside, there are many aspects of the festival that will remain the same, starting with the event’s benefactors. Since its earliest days in the mid-1980s, the festival has served as a fundraiser for adaptive sports programs geared toward persons in the community with disabilities. Over the years, the festival has netted nearly $2 million toward 30 county-based programs. As has been the case in the past, Mullen said the roll-up-your-sleeves spirit of volunteerism associated with the event will remain an important foundation for years to come. “There are literally thousands of hours of volunteer time that go into making all of this possible,” said Mullen, whose day job is associate publisher of San Diego Magazine. The publication has been one of the festival’s sponsors in recent years. Also untouched is the heart and soul of the program, the artists. Ballantyne said nearly 200 artists are expected to take part in this year’s festival. The artisans represent nearly every form of media imaginable, including painting, sculpture, photography, glass jewelry, ceramics, wood and fiber. While many of the participants are San Diegans, the festival also has drawn artists from other corners of the U.S. and the globe. Alongside the art displays, the festival will continue showcasing musical talent, including a number of local acts. The itinerary is still being assembled, but one confirmed participant in this year’s roster of musicians is San Diego-based, Grammy Award-winning jazz guitarist Peter Sprague. With the countdown clock ticking and final pieces of the preparatory puzzle coming together, Ballantyne said he is optimistic this year’s festival will go off without a hitch and usher in the new era for the popular festival in its new venue. “The arts culture scene is very vibrant in San Diego,” he said. 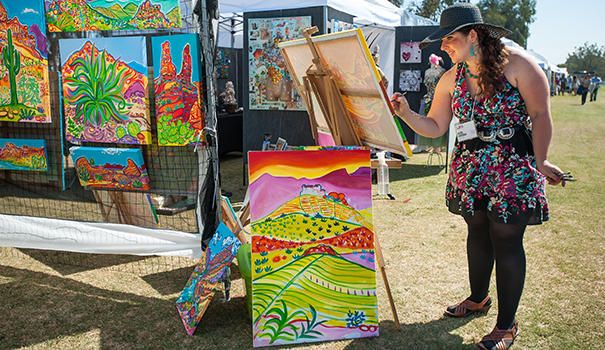 The 30th annual San Diego Festival of the Arts will take place June 11 and 12 from 10 a.m. to 5 p.m., at Waterfront Park, located at 1600 Pacific Highway, Downtown. Tickets include one day general admission: $12 online, $14 at the door; full weekend admission: $16 online, $18 at the door; and children 16 and under and active military are free. All tickets can be purchased online at sdartsfest.org/tickets. For more information, visit sdfestivalofthearts.org.